In today’s hectic world, people yearn more and more for tranquillity and simplicity. Axor Starck focuses on the basics: the enjoyment of water. The principle of reduction can be seen in the basic shapes and clear functions. There are no distractions. A bathroom collection, designed by Philippe Starck, that will never go out of fashion. 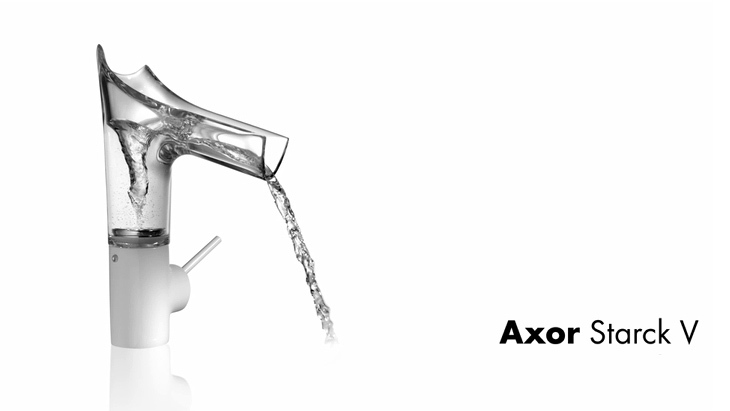 Like a fountain that springs up from the depths of the earth, we can draw from Axor Starck. and refresh our bodies and minds in an environment that offers tranquillity and relaxation. The transparent glass mixer designed by Philippe Starck enables you to experience the inherent vitality of water at your own wash basin. The open-ended spout made of crystal glass can be swivelled 360° and can be removed for easy cleaning. In addition to the chrome and high-gloss white variant, the Axor Manufacturing Department also offers twelve other surface finishes. The mixer appears to float weightlessly above the wash basin – and is available in four different heights. Supplemented by electronically-controlled mixers and a version for the wall. 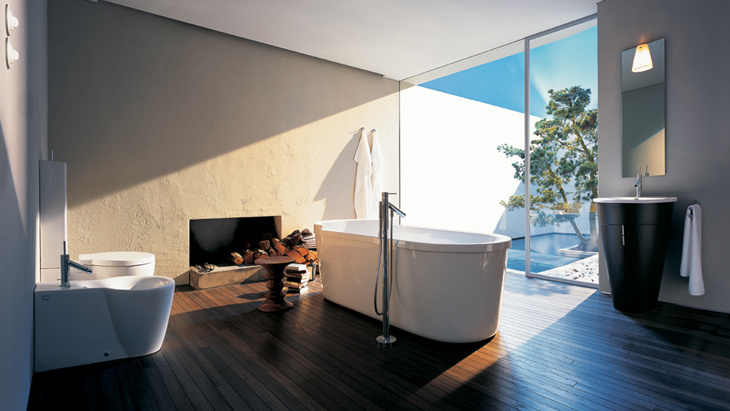 In addition to the floor-standing mixer, Axor Starck X also offers a wall version for the bath tub. For the shower area, you can choose between different mixer variants in geometrically minimalist design. From the shower column to the Waterwall shower system, from the manual shower to the overhead showers: Axor Starck offers an extensive selection of products for the shower. The thermostat is already integrated in the Axor Starck shower columns. The overhead showers from the Axor Starck collection offer a truly special kind of showering experience. The accessories, such as the soap dish and toothbrush tumbler, reflect the timelessly purist style of Axor Starck. The single hook resembles a simple nail: for the accessories, Philippe Starck took inspiration from archaic models. The shelves, lotion dispenser and wall lamp are also minimalist. Axor Starck offers four functional mixer versions with characteristic joystick operation. The versions with swivel spout or hand spray with two jet types provide a large operating radius at the sink. With a 360 degree swivel spout, the Axor Starck Semi-Pro variant is ideal for double sinks and island solutions in the kitchen. Which wash basin matches Axor Starck? Which wash basin matches Axor Starck X?